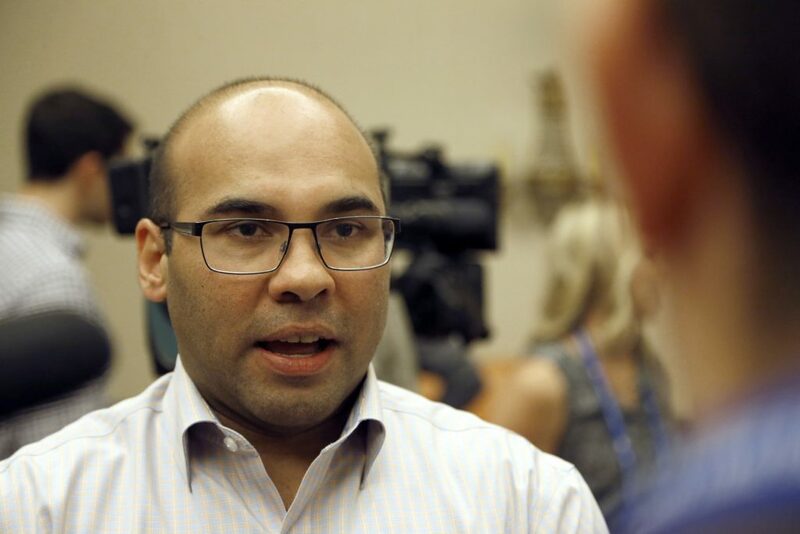 This is the best Farhan Zaidi can do? The Giants’ new president of baseball operations put together an opening-day starting lineup with two no-name outfielders — Connor Joe and Michael Reed — and designated both for assignment within two weeks. Is this any way to start a baseball season? Very bad look for Zaidi. A look that makes you question his capability to run a franchise. Sure, the Giants presented him with a mess. He inherited an old, bad, expensive, declining team. Not his fault. And we’ve heard good things about him. He did well with the Los Angeles Dodgers and Oakland A’s, although he never won a World Series. But is he really this timid? When you come to a marquee franchise like the Giants, and push out Bobby Evans, Brian Sabean and Bruce Bochy, or appear to push them out, you have to do bold things. Either build the team up or tear it down. One or the other. Nothing Zaidi did this offseason was bold. TY TY TY , Grant. OT, but still dealing with leadership decisions. Zaidi gets a pass from me, because he did offer Harper over 300 mil. Philly just out bid the Giants, and the Giants decision to not build that wall will haunt them. I was pleasantly surprised that Farhan did get Pillar, because the opening day lineup was anemic. Still think they should target a player from Cuba and Japan, and maybe even Australia. I am glad he did not deal Posey or Baumgartner. Kepp the WS team together, and add some talent so Bochy can go out swinging, and making noise. Who the phuk is Baumgartner? Who the phuk is Kepp? That’s not a grammar issue, moron. Grammar can be used to encompass aspects of spelling and punctuation, for some folks, but close minded individuals cannot handle that. Funny. He’s always pointing others’ typos, grammar, weird autocorrect and spelling, but doesn’t like it when directed at him. You are the point person for correcting others grammatical and spelling mistakes. I would take this as a lesson learned – none of us are perfect. And I would be the first to say that I certainly am not. Duly noted, but I usually use snark only when attacked. Many times, I will just make the correction, and not swear or add the moron insult with it. That was just a whining complaining mess of an article. The only solution you offer is “sign Bryce Harper”. I’m pretty sure they tried. 12 years $300M is a pretty BOLD attempt. Harper took Philie’s offer and never gave the Giants a chance to counter. Then you state the obviousness of needing to do something about Bumgarner and Posey. The best bet at the beginning of the season was to try to showcase Bumgarner to trade him at the deadline where the Giants would get more value. Bumgarner’s been scuffling a bit but some of that is on Bochy for leaving Bumgerner in for too long in the last game. Posey? He’s probably not going anywhere. He’s coming off an injury so he hopefully makes a comeback. But getting rid of him now or earlier in the off season would also not have been optimal because he was coming off of hip surgery. No one was going to take him for more than a ham sandwich. Zaidi has been painted into a corner and doesn’t have that many moves he can make. What do you suggest he could have done or should do? Not a Giants fan, but it appears Zaidi may be wanting the team to tank in order to rebuild the team. My family didn’t talk to me for a couple days when I suggested that SFG’ should trade Bum at the end of 2017 when his value was at peak level. I knew then that the team was going to fade because of their age and inability to groom young talent in their minor league clubs. Not making the bold moves back in 2017 have hurt the team of any trade value from the current roster as you’ve noted. As I’m writing, the Giants just won the in which Pillar hit a home run earlier in the game. At the moment the team lacks speed, power, consistent pitching and youth. I would like to see Joey Bart make his way the to big’s sooner than later. Zaidi has his work cut out no doubt, but after the last two seasons the Giants needed to make a bold move in hiring a new GM. Now lets see if they avoid a 70-80 loss season. I’ll take Ott and Mathewson………not really i’m not that old. I miss Matt Cain, Tim Lincecum and Sergio Romo. I miss them too. But I think you missed my point. No, I just wish the Posey from those WS years would return. Me too but the hard reality is that it probably won’t happen. 32 year olds coming off of hip surgery usually aren’t as athletically gifted as their healthy 25 year old selves. I sure like his arm. He threw out that player trying to steal, with a cat quick release. I love me some Joey Bart, and he’s got Super-Stardom written all over him, but I’m not sure I want the Giants to rush him up to the big show before he’s ready. As for Buster … it’s been a catch 22 (pardon the pun) for years now, as to whether the Giants should move him to first base. But he is still one of the MLB’s best defensive catchers, and especially adept at calling games. The Giants pitchers have always benefited from having him behind the plate, and that’s still the case. Unfortunately, the wear and tare has taken a seriously toll on him physically, particularly at the plate. He’s lost most of his power coming off of off-season hip surgery, but I wouldn’t be too quick to drive the nails in his coffin just yet. I think there is a decent enough chance that he’ll work through the hip issue, and get most of his power back by the all-star break, but he’s going to need to take his share of games off during the first half of the season, and that does make it awfully tempting to bring up Bart, who did gain experience calling games in college, which is actually quite rare these days. I’m certainly not holding my breath until this team turns things around, but the MLB baseball season is a marathon, not a sprint. And the old addage that pitching wins pennants still applies, as long as you can score some runs. The Giants are currently sitting 3rd in the NL in team ERA, and I expect they’ll be near the top of the league in fielding as well. If they can just start generating some offense, and driving in those RISP, they have a very good chance at being, at the very least, competitive this year. However, I agree that if they aren’t looking like they can score enough runs as we approach the deadline, it’s time for a fire sale, and MadBum should be the first out the door, as he should bring us a bounty of quality prospects in return, for which the Giants can kick start this retooling effort. And I wouldn’t stop there, as there are a number iof quality arms in the bullpen for which teams are always looking for as we approach mid season. Again though, it’s a marathon, not a sprint. It’s too early to say for certain just how good or bad this team will end up being, as this long, grueling season progresses. Oh wait…its oneniner…or is it Darren…maybe its Seb now. His plan begins in July. At that time he will trade Bumgarner, Holland, Pomeranz and possibly Belt. He will rebuild the farm system in one month. Along with the trades they will have a top 5 pick in this years draft as well as a possible #1 pick next year. Did the Astros make any bold moves in their 3 straight 100 loss seasons? Ugh. I do not like this narrative. I hope he scours the world for some baseball talent, and gets some bats. I even wish they would put Pablo in LF, for his bat. I hope Zaidi offers a decent relief pitcher to get Kris Davis. Dugger is not the answer. I hope Zaidi gives Bochy enough talent to be able to score some runs. Davis may have the worst arm in baseball. Zaidi values defense to much to put Davis in LF. I want him for his bat. Duggar and Parra are not impressive. the only reason to sign or trade for a 31 year old Davis would be to flip him (likely what Beane has in mind). But there’s no sense trading anything significant for him as his value will already be high when you acquire him so there’s presumably not much upside left to get more for him in the future. His bat would be very welcome, to me. Zaidi should be very familiar with him. Seb, I love your passion, but it’s a little to early to be giving up on Duggar, don’t you think? My gosh, were 14 games in, with 148 games left in this season, it’s far too early to make any rash decisions. Let’s at least give this team till the end of June, at the earliest, before we start giving up on any of our young, promising players like Steven Duggar. Zaidi absolutely has a gameplan, and as we get closer to the deadline, if this team isn’t looking like they can potentially contend this year, that’s the time he will start moving players, and restocking this roster and farm system. Duggar looks like a newbie. He lacks confidence at the plate and his swings are feeble in their impact.Maybe they should have batted him later in the lineup, so he could watch what the pitcher throws, before facing the pitcher first pitch. The pressure is on, and I think another player could handle it better. I do not hate Duggar. I sure wished he had gone out, and piled up some RBI’s. This is a results based business. I agree, there will be lots of moves this trade deadline. I hope they are shopping for that last piece of the puzzle that will put them into the playoffs, instead of selling off and rebuilding. 49, while Duggar did get 2 hits last night, he has struck out 18 times this season. That is not a good stat for a leadoff hitter. Well, then maybe he shouldn’t be hitting leadoff then right now? That doesn’t mean “Duggar is not the answer” in RF. Again, we’re now a mere 16 games into a 162 game season … so why in the world would you, or Grant, be ready to pass judgement on a rookie, who, BTW, had 2 more hits in today’s win, and the Giants are only 1.5 games behind the hated Dodgers? A baseball season is a marathon, not a fricken sprint, for crying out loud. 16 games isn’t enough to determine anything in baseball, which is why Grant’s way too premature criticism of Zaidi is a real head scratcher! For the San Francisco Giants, it’s all about pitching and defense, while scoring just enough runs to string together wins. It’s been that way going on a decade now for the Giants, spanning 3 World Series victories. I’m not saying this is a championship team, but I am saying it’s way, way too early to know for certain just how good or bad this team is going to be. However, they are currently 2nd in the NL in ERA, and that’s a very big deal in baseball, especially in the NL! Right now though, it’s all about those Golden State WARRIORS! 49, this post is about the SF Giants, so it is logical to talk about them. Farhan did not get some big bats, and they struggled in Spring training, so the struggles during the beginning of the season were predictable. Did you notice they took Panik out of the 2 spot, and batted him 7th? Smart move, to juggle the line up, until they find the best batting order. Oh, and if Grant does talk about the Warriors, I hope he mentions that they have an embarrassment of riches. They have an All Star team line up, and a very competent coaching staff that knows what to do with their talent. Sorry Seb, I didn’t mean to snap at you. I’m just a little frustrated with Giants fans in general, not you personally. As good as they have been since 2010, they get off to a slow start in 2019, and suddenly everybody has given up on them, throwing in the towel after 15-16 games, empty seats all over the ballpark? Grant Cohn ripping Zaidi. Bruce Bochey deserves better. I’m not talking about you personally Seb, you seem like a genuine fan, but man, are some fans fickle or what? Baseball is a streaky sport, look at the Dodgers who are suddenly staring at .500, after a hot start. I’m not saying the stinky Dodgers won’t likely have the better season, but I think this Giants team can, and will be competitive, especially if they find a proper leadoff hitter to bring some energy to the top of the lineup. Wouldn’t you agree that their pitching will likely keep them in a lot of games this season? 49, yes, the pitching is surprisingly good, but the team should not count on winning 1-0. Zaidi did try, so I am not ripping him too much, and he did get Pillar, so that is a good positive. I just hope the whole team starts to hit, and they can average 4 runs per game. I think getting another bat in the outfield is essential for success. Right now, I hope Bochy makes an adjustment, and moves Duggar out of the leadoff spot, and lets him work his way back to getting more comfortable hitting. Crawford seems like the logical choice to lead off. He may not have gotten many hits the last couple games, but he is hitting the ball hard. After watching the Warriors play, the only question is- do they win in 4, or do the Clippers manage to win a game? The way Steph is playing right now Sebnynah, that’s an easy one I think. Warriors in 4! Did you see Steph take a long 3, get knocked down, and no foul called? I could understand a little pushing, but he was bowled over. smh. I think that Zaidi has more flexibility than the Astros did with their rebuild because of the Giant’s big pocket book. They’re willing to spend on big name free agents. Plus Zaidi can sign whatever free agent he can to improve the team or flip for more prospects (essentially using his free agency money and turning it into prospects). So his ability to possibly sign big name free agents (that are hopefully younger for the long term plan) and short term free agent MLB players that he can flip may mean that the Giants might be able to field a competitive team faster than Astros did with their turn around. Bosa belongs in a nice Red state like Arizona. I don’t think it matters as long as he plays well. Most fans aren’t going to care. And remember a good portion of the 49er fans aren’t Bay Area liberals. Many of them come from more conservative inland areas. If he wanted be drafted by the 49ers and the closest to San Francisco he may have to get is the airport (and that’s IF he and the 49ers don’t elect to fly out of San Jose). believe it or not, AZ doesn’t really meet that standard any longer- the Goldwater days are long gone…….. surprising, I know (my father-in-law lives down there). Exactly what is it about Arizona that one would consider “nice” CFC? I guess if you are into violent crime and lousy weather, Arizona might be your place. And sure, Arizona may be “nice” compared to states like Alaska, Louisiana, Alabama, Missouri, and South Carolina, who all have higher violent crime rates and arguably worse weather, but that’s not saying much. As an A’s fan I think Zaidi is doing a brilliant job. Not a fan of the Giants. Ah, got it. Do you think the A’s will make the playoffs this season? I doubt it. No. It’s only a matter of time before Beane has successfully traded away all of the talent that might have helped us make it to the playoffs. I wouldn’t say brilliant but I do believe he has a long term plan. If he trades 2 to 4 starting pitchers in July you will know his plan is to build from the bottom up, a lot like the Astros. I have to say I find it somewhat amusing that so many people are ready to bury the Giants 16 games into a 162 game season, especially with such a talented pitching staff (the Giants are currently ranked 2nd in the NL in team ERA and 4th in the Majors) but whatever. Like Hank Schulman says, it takes at least 40 games into a season before you can even get a handle on what to expect from any given MLB team. I think Bochey is a very average manager during the regular season, but if they sniff the postseason … look out, because he’s one of the best postseason managers of all-time! 49, I am just keeping it real, and although the bats came alive today, those early losses were due to a lack of timely hitting. I am happy Posey got 2 hits and an RBI, but the Giants need to start hitting more. Yes, I like how the starters and bullpen are doing well, but the Giants will not sniff the playoffs without another big bat in the outfield. I hear a lot of complaints about Zaidi’s lack of off season moves. I get that it’s a frustrating position to be in. But I don’t hear many other solutions being offered to the Giant’s problems. I’m certainly interested in hearing some ideas but honestly the situation looks pretty bleak in the short term and I think the really painful moves (from a fan/nostalgia standpoint) are yet to come. I actually am hopeful. The Giants did upgrade their pitching staff, so all they need to do find some bats in the outfield. Still do not know why they will not put Pablo in left, his bat would be welcomed in the line up, and I do not think he would be that much of a liability, defensively. One way they may improve is finding a better batting order, That 1-3 loss was partly due to the lack of timely hitting. If they can find a better batting order, they will score more runs. Botchy loves Pablo and even he isn’t a fan of putting him in the outfield. I thought for the past week that he should have been starting over Longoria who has been abysmal while Pablo has been hitting above .300. But then Pablo started last night and went 0-3 or 4. How did the Giants upgrade their pitching staff? Pomeranz has been playing like a borderline 5th starter. Look at the batting averages of the Giant’s players. Who do you suggest being shuffled around? After Crawford as the 3rd best batting average (with Austin Slater’s small sample size being the top) at .271 every single Giant’s batter drops off a cliff with many batting averages far below .250 and some below the Mendoza line. I hate to use the over used analogy but rearranging the batting order is like shuffling the deck chairs on the Titanic. Well, so far, being static is not working, and they have shuffled the lineup a lot, also with little improvement. Just got to find the winning formula. Maybe Crawford leading off, Buster second, Belt third and Pillar hitting cleanup. Then Pablo (LF), Longoria, Parra (RF), and Panik as 5th, 6th, 7th and 8th in the batting order. I do like Holland, and both Mad Bum and the Shark are doing well. Their bullpen looks strong. Maybe bring up Joey Bart and stick him in the outfield. You’re assuming there’s a winning formula and that the most optimized line up hasn’t already been tried. If Pillar and Samardja keep playing this well, they’ll be gone by the trade deadline. I’m not sure why you’d want Buster hitting second. His batting average is .205 and he gives you no speed/base running ability when he gets on base. I say bring Bart up and have Posey rest his hip on the bench for a while. Mix Posey in as the back up catcher and back up first baseman. If his bat gets right, put him back in as the everyday catcher (and possibly trade him). I still believe in Posey, but do not want him hitting third. OK. Then Crawford, Belt, Pillar Pablo, Posey, Longoria, Bart and Panik. Slater (small sample size but he’s batting above .300 and has walked) LF? Parra is basically an auto-out over the last 7 games hitting .118 with one walk. I guess you just hope he can get better? Or continue to develop Duggar who’s stats aren’t much better over the last 7 games. That would be a good lineup. Moving on from Longoria, but Bochy would be playing the hot bat. Belt at 5th for his HR potential. Duggar is striking out too much. Really, the 2 biggest problems for this Giants team is that they don’t currently have a true, consistent leadoff hitter, and they aren’t getting anything out of Longoria. What the he_l happened to longoria? If they can find a scrappy leadoff hitter who can get on base consistantly and make pitchers uncomfortable on the base paths, and Evan Longoria starts hitting like the Rays’ Evan Longoria … well then, they just might have something. So, put Crawford as the leadoff. Put Pablo in at third. Use Longoria as a pinch hitter, and see if he cannot regain his stroke. Make sober assessments, and timely adjustments. They’re 14 games into the season……….. let’s give the Giants a bit of a leash before tossing some dirt on them- at least, I will. I do believe they are going to need to add some speed and get more aggressive in small ball if the bats remain unreliable (which they probably will due to the contracts they have). I also believe we will continue to see a lot of movement in the outfield with call ups until someone proves they can stick. Sure wish Grant will do another player analysis, so we can move on from baseball and Bosa. Didn’t you send out a tweet asking if you were the only one who thought that Zaidi was doing everything right in the off-season when many were panning him? Yeah, he definitely should have signed Harper but don’t think it was him who decided on the amount to offer. That they are 5-9 right now is actually pretty impressive to me. That’s how low my expectations were for them. Need to get to SJ quick though to catch the Joey Bart show before he’s off to Richmond. That’s when I thought I knew what he was doing. Now, I’m lost. what specifically do you think he should be doing? I have limited baseball knowledge. But from what I see, Zaidi doesn’t have that many moves he can make in the short term….now the trade deadline should be interesting. He shouldn’t trade prospects for major leaguers. That’s what he’s doing. Like whom? Who should he have not traded for? I answered that question in my column. yeah…I think you failed to see the game plan. 1. you need to field a viable team. A. Trade away tradable assets (Bumgarner, maybe Posey….looking good at this point would be Samardja…maybe Will Smith, Belt or Moronta). Assuming these guys don’t fall into a black hole (which may be the case for Posey at this point….and if they don’t manage Bumgarner better…) their value will be much greater at the trade deadline. B. Acquire lower risk MLB players for minimal investment. Then trade them away once they’ve developed a little bit or simply have a good season or are in the middle of a hot streak. Low risk players are going to be fringe players (otherwise they’d require significant investment). So you get a bunch of 0 WAR players and they hopefully perform at 1.0 WAR and you trade them for some club’s #25 prospect Rinse, Wash and Repeat until something sticks. You get enough #25 prospects and hopefully one or two of them pan out in the long term. Could he getting rid of those prospects in order to gut and rebuild their farm system? according to Harper’s account, he didn’t give the Giants a chance to respond to Philie’s last offer. Yeah, it pretty much sounded like he was set on there anyway and was just using SF as leverage for the best possible deal. Reuben Foster not facing any suspension. Can start team activities with Washington immediately. Sorry bud, I didn’t catch your earlier entry on Foster. Hey Sebbie… Niners sign another ex-AAF (and ex-Falcons) player! Cassie, I saw it, and then saw Razor had linked it after pointing it out to you, so this is the third time he has gotten attention He was a perfect aaf lineman at 260 lbs, but the NFL may want him to bulk up 40 lbs. Maybe his best bet is for him to be used as a blocking TE, since his catch totals have not been stellar. However, I hope the Niners sign a TE who can block and catch. there are recent articles that list him at 290 lbs. Looks like our old friend Reuben Foster was reinstated by the NFL and only docked 2 paychecks. Unless Foster has had a serious come to Jesus moment Washington will be on buyer beware mode. But I actually hope the kid can turn it around for the better and have a good and long career. At the moment, I look at Foster and Aldon and can’t help to think of what might have been. The Warriors (our current Nor. Cal championship pro team) are prepping for another Chip. Will you be doing a write up on them? Interesting. Dave Lombardi thinks the Niners will be trading back. I think they will trade back twice to get two additional second round picks. He specifies that it will probably be with a QB hungry team, and /or the trade will be with Gruden for Bosa as the player to replace Mack. I hope the Niners trade back with Oakland, and get their first, second and 4th round picks (4, 35, 106), along with a 2020 third round pick, and then trade back with the Giants, after the Jets select Allen. Giants want to leapfrog over the Bucs because they may take Haskins, or trade back with a team who wants to poach Haskins before the Giants pick. For moving up two spots, the Giants secure Haskins, and give up third and 4th round picks (95, 108.). This almost balances out perfectly on the TVC. The Niners could trade back again, with the Broncos. Denver would give up their first third and 5th round picks (10, 71, 148), to move up 4 spots and select Lock, who Elway likes. The Niners could execute a 4th trade back, by moving back from their second round pick. By moving up 15 spots, the Titans would give their second and third round picks (51,82), for the Niners number 36. and select a RB or Safety they covet. The Niners would end up with pick numbers 10, 35, 41, 51. 67, 82, 95, 104, 106, 108, 148, 176 and 212., plus a 2020 third round pick. By moving back 23 spots, in 4 trade backs, the Niners end up with 13 picks spread fairly evenly throughout the draft. 7 picks within the first 95, and 10 picks in the first 108. Do not know if the Niners could pull this off, but it would give them a boatload of picks. Oh heck, throw Mullens in there and gain another 1st this year, a first next year, and an additional 2nd and 4th this year. Who cares if the 9ers won’t have the $$ to sign all these picks…. I think the Niners have 36 mil in cap space. They would be locking them up under rookie contracts. That seems fiscally sound to me. I will give Grant till July before he puts Zaidi on the hot seat. No, he did it April 11th. Yep, that is a stupid @$$ tweet. 😖 Now let’s get back to football. Why is the text in bold? I did not select the bold icon. Not on my part Seb. The keypad on my phone does not have a bold function, and I did not touch the icon that brings up text like this. Understandable, but the bold text wasn’t done by me. What a game. 18 innings. While having an impotent batting lineup, they still have a will to win. I fell asleep after the top of the 18th…….. naturally. Aw, you missed the fireworks! What should be the draft priorities? Grant thinks a WR, but 2 is way too early for a receiver. Maybe if they trade back a couple times, and get multiple second round picks. I think the interior O line should be upgraded. I think the TEs need help. QB and RBs seem solid, but the WRs may be a priority, with so many speedy Flankers available. Actually, I hope they pass on Bosa and Allen to trade back, and select Ferrell, Burns, Gary, Oliver or Sweat. The D line looks solid with the addition of Dee Ford, so the pass rush should be a need, but not a priority. If they do trade back, Devin White or Jawaan Taylor may be the BPA. Maybe move back to 10 and select Hockenson or Fant. Since there are so many DBs coming back from injury, I would not say the DBs are not a big priority, but a need for insurance in case of more injuries.Maybe the scouts can find that Earl Thomas type single high safety. For LBs, I like Germaine Pratt, Blake Cashman or Tyrel Dodson. I think it goes without saying that your knowledge of ball carriers/receivers in the 2019 draft is unparalleled. So, given your heart-felt call for ball carriers and receivers to fall down before contact, which prospects in the 2019 draft do you feel would be the most likely to fall down before contact? Would you take them over ball carriers/receivers with better skills who won’t/don’t fall down prior to contact? Cassie, why don’t you post a mock, then maybe I will consider your request. Don’t need no stinkin’ mock. Just identify which RBs, WRs, and TEs in the upcoming draft you feel are the best ‘fall-down-ahead-of-contact’ prospects. A mock draft has NOTHING to do with it. Troll. Try being a gadfly towards another poster. Do not ask me me to do something, then refuse to do something that I ask you to do. The stench of Baalke always lingers. You know Sebbie… I’d fight to the death to defend your right to express your opinions. Was simply curious if you see good ‘fall-before-contact’ prospects in the draft. Asking for an opinion–your views on the matter. I’m disappointed that I’d be giving my life for a vacuum, but a promise is a promise. I remain steadfastly yours. Why is no one commenting on Longoria. This guy is bona fide boring. He takes up space, just mediocre. Put Pablo back in as regular 3rd baseman. We need his bat and his pop, and his defense is good. I don’t believe there is an easy answer there w his contract…….. I imagine they will be evaluating his at-bats more closely should his avg not improve. Really, the 2 biggest problems for this Giants team is that they don’t currently have a true, consistent leadoff hitter, and they aren’t getting anything out of Longoria. What the he_l happened to Longoria? I thought for sure Longoria was going to have a bounce back season, especially after he got off to a decent start during the first series of the season. This season is still in its infancy, so he may very well turn things around, and I think he’s absolutely going to need to in order for this team to remain competitive. I think they are also going to need someone to emerge as a high-energy leadoff hitter, a la Angel Pagan – circa 2012, whether that person is currently on their roster, or in their minor league system. As good as their pitching may be, somebody is going to have to inject some life into this offense, if this team is going to remain in contention until we get closer to the trade deadline. And if they remain in the hunt, who knows, maybe they can go out and find a 2019 version of Marco Scutaro? Interesting. You want to rip Longoria, but he was the only Giant to get a hit, today. That bona fide boring mediocre player, prevented a no-hitter. In line with your running critique of Grant’s periscope sessions, I’m confident you have constructive input for Alex, no? Put up a mock, I could use a laugh. Nice. Still want them to trade back, but I like your Thornhill and Okereke selections. Just think AJ Brown goes in the first round. Trade back trade back. Like a parrot squawking. Still waiting for that Kap signing. Hi Prime, now go crawl back under your rock. Where is the board for your latest article Grant? Less than 2 weeks from the draft, Grant promises a bunch of evaluations, and then he posts something on baseball, after going political. Hope we can get back to the draft, and football, soon. Perusing the NYG blog, it sounds like they are happy to miss out on Haskins. Yes. You’re right, this blog is stale. You should go find another one. No, the draft is coming up, and there will be lots of comments pre and post draft. I already do peruse the other blog sites, but still find this one compelling, even with my gadflies. Gruden told Mayock not to screw up this draft, so I wonder which direction Mayock may want to go in. Since they traded for AB and signed Tyrell Williams, the need to draft a replacement for Cooper is negligible. However, they need a replacement for Mack, so Mayock may want to trade up with the Niners, since both the Niners and Jets could select Bosa. If the Raiders give their first, second and 4th round picks (4,35,104), and a 2020 third round pick to balance out the TVC, Mayock could obtain the Niners number 2 overall pick, and still retain their 24th and 27th picks. Getting Bosa as the replacement for Mack, may be a high priority for Mayock. Mayock may also be listening to the chatter, and realize that Elway really likes Lock. He may take Lock to provide competition at the QB position, and deprive the Broncos of the QB they covet. If the Raiders want Haskins, they may need to trade up with the Niners to get him, because several teams may also be wanting to trade up. Darn, I was hoping Gruden would be the one making the draft selections, but he is handing that responsibility to Mayock. Gruden would probably screw up royally, so Mayock may actually handle this right. I hope KS is also letting JL make the major decisions.The trade ups for Foster, Joe Williams, CJB and Pettis should be critiqued, an I hope the Niners do not repeat their mistakes. How are those 2.5 acres lookin’ today? It’s not always that easy to gauge a person’s heart. Foster was a big gamble because of his unstable background. But he was also one of the top (if not the top) LB in his class. Lynch took a shot because of Foster’ ability, but it was Foster’ personal demons that got him ushered out the door. Joe Williams was a good player that Lynch felt could help the team. Choosing him was not a bad move at the outset, but how was Lynch supposed to know that William’ would lose heart for playing football again. I have little doubt that Foster and Williams told the 49ers brass that they would be all in if drafted. I wouldn’t put Pettis and CJ in the mistake category. CJ will likely be fighting for his job in TC, but Pettis is far from a mistake. With all the talk lately about drafting a WR it wouldn’t surprise me if Pettis emerges as one of our top WR’s in 2019. I have no problem with critiquing Lynch for some dead-in draft picks, but at least give him credit for Kittle Warner, McGlinchey, Breida and Mullens. And we might be able to add Dee Ford, Alexander and Verrett to his resume. But if it makes some happy to critique while dismissing the positives more more power to ’em. AES, I just think they could have been patient, waited until their assigned spot, and selected Pettis while saving that pick to move up. I am not dissing Pettis as a player, but the trade up that seemed desperate. I even like CJB, but he had a bad hand dealt to him. I kinda lump all these trade ups together as KS moves, because JW< CJB and Pettis seemed to have his fingerprints on them. You cannot deny that both Foster and Joe Williams were mistakes, because both disappeared like a puff of smoke. Looking back, no, I can’t deny that. But right now that has more to do with Monday morning QB’ing, because when they were drafted we didn’t have a clue what direction their careers would go. Drafting any player has the potential for success or failure. Yes, I will be the first to admit that the draft is just rolling the dice. Sometimes it takes 3 years before a rookie can be adequately assessed. However, with hindsight, then you have the Foster, AJ Jenkins and Jamarcus Russel picks, which flamed out spectacularly. Nice Masters win(as reported by Yahoo Sports) from Tiger today. Any chance he retires while on top? No, he wants to beat Jack N.
Yup, that makes good sense, Seb. It’s been quite a journey in Tiger’s return to glory. Any chance AT&T, Accenture, American Express, General Mills, TLC Laser Eye Centers, Tag Heuer, Rolex, Gatorade, Buick or Gillette bring him back into the fold? But if they don’t, others will. Tiger just pulled off one of the most improbable wins in his career and no doubt the advertisers will want to follow him like Polit fish follow a shark. Everyone loves a great comeback story and no one loves it more than advertisers. Hey Sebbie, if you haven’t burned too many bridges, here’s your shot! Imagine…sitting at your window, looking out at your 2.5 acres with cup o’ Joe in hand, ready to pounce on those keys for Niners Nation! You have the ego and the thesaurus! Next stop, ESPN and all the adulation you crave. This post is four days old and it’s a baseball post–not bad–but not football. C’mon Grant, I need a distraction. Take the journalistic blue pill and get another football related post up here. Is this the article (without comment section)? Yep, it’s finally over. It was a good run while it lasted. A big thanks and appreciation to all the great discourse among the faithful in here. I bid you all a heart-felt adieu! Could be hiding in the Indonesian embassy. Yes… and it would be a good board to comment on. If PD started charging for the site I would just switch to the athletic and probably find another message board but I would miss the community here a lot. I’ll miss all you guys for sure, but I refuse to pay for any site. I’ll just get my information secondhand. It’s expensive enough just for internet service, let alone charging for websites. I accessed this article from the PD sports page without encountering a pay wall, but it isn’t grouped under Inside The 49ers, just as a free standing article. Whoops. The comment section does require a subscription though to read or post. We’ll have to pay up or shut up. Seb can’t shut up, so he’ll be out some jing. I was thinking the same thing, but its been somewhat quite on the football front the last couple of weeks. The only story of note last week was the Reuben Foster reinstatement and this week it’s beginning to look like the Russell Wilson’ contract deadline may get some play. In the next couple of weeks the business of football will begin in earnest and we will have football filling our lives once again. I like Kiper’ line of thinking because he’s seems to be on top of the 49ers positional needs and where they/rd should be picked. Except for Bosa, I’m a little concerned about the 2nd and 3rd rd picks. Whiteside has put up nice numbers, but I’m a little hesitant in drafting Stanford players these days. Mullen has the physical attributes that Lynch likes but his field performance is nothing to write home about. 3. Jace Sternberger (my surprise/sleeper pick). Agreed. There are several wide receivers I would take over white side. I like him as a red zone receiver but I wish ever ball wasn’t a jump ball with him. He struggles to get open to much for my taste. I don’t think Shanny values those type of receivers as much as he does separation, agility, polished routes.